I really want Ryan Reynolds to succeed. Ever since I got home from school and watched him in 2 Guys and a Girl (and a pizza place) and then started to see his fame take-off with movies like Blade Trinity and Van Wilder, I always thought he was a star waiting to happen. Unfortunately, there have been some dodgy movie choices or films that may have deserved to do well that just didn’t. For example, Green Lantern was a great potential franchise but went nowhere because of it’s poor, generic story while movies like Buried showcased what an acting talent he is but nobody seemed to pay attention. After bombs like RIPD, Ryan Reynolds seems to be doing the smart thing and taking it back a step – doing an out there indie movie that can really demonstrate his acting abilities. To his credit, The Voices does exactly that. It isn’t just another romantic comedy where he plays the charming handsome love interest or a generic action movie where he is the wisecracking hero. 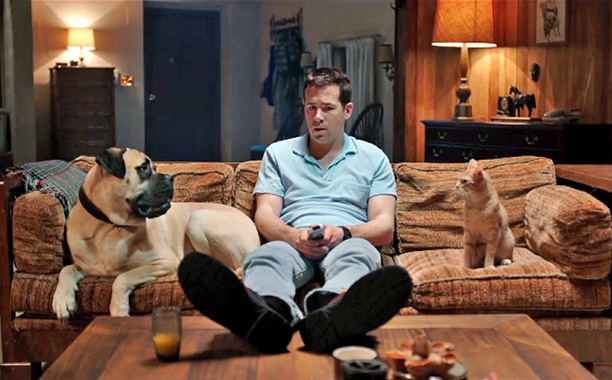 The Voices sees Ryan Reynold’s playing the quiet, creepy and unnerving serial killer who hears the titular voices, more specifically, those of his two pets, a cat and a dog. Ryan Reynold’s is almost unrecognisable in the role. He isn’t confident but nervous and agitated, he isn’t funny but cringe-inducing and awkward and he is certainly no ladies man, as he tries desperately to get Gemma Arteton’s Fiona to notice him. It is these chain of events that lead him to become a serial killer, with some very disturbing moments to accompany it. The role works because Reynold’s is not this kind of character and has never played it before. He does it so convincingly and when you couple that with the two animal’s voices, which he also provides, you get a very accomplished performance that sells how troubled, creepy and dangerous his character is. The darker elements of the story have potential as either a great psychological horror or straight serial killer movie. The inspired performance by Reynold’s as the two animals and some of the different situations he finds himself in could make for a very funny black comedy. Unfortunately, the movie doesn’t know what it wants to be. At times it can be very creative. We get to see the movie though Reynold’s eyes and at times, that cover is taken away, revealing the truth to where he lives and what he is “actually” seeing. Moments like this are both scary and disturbing in equal measure. They are few and far between though and what we are left with is quite a dull slog through a man falling apart. The movie doesn’t move with any sort of pace or purpose, meaning we are watching the slow unfolding and unravelling of Reynold’s character’s life in slow, real-time. The dark moments don’t make up for when he is sitting with his pets having a twisted conversation and the scenes where he plays all three characters in the same room are not as funny as you want them to be, which makes them dull and uninspired. It is a waste of a brilliant idea and a great performance from Reynolds. Rather than get a movie where he plays against type as an awkward, desperate and insane serial killer, we get a performance lost amongst a movie confused as to whether it wants to be a dark drama or a black comedy, offering shades of both but doing neither very well. This culminates in a pretty stale ending, not really offering the potential pay-off from the events before it. It feels stilted, as if the story had no real direction or final point. I always think it is very telling when a movie, indie or not (but usually indie) ends on a musical number, completely devoid of any link with the rest of the film. This always signposts a desperate attempt to distract from the poor actual ending to the film. Overall, The Voices has all the ingredients and ideas to be a great, scary and/or darkly funny movie but wastes them by being direction-less and trying to do both elements badly. Reynold’s is great as the creepy serial killer and his voice work for both of the pets is also an inspired piece of casting. Unfortunately, the rest of the movie lacks any drive or purpose and we are left with an aimless slog to get a drab-ending. Weird, but funny. Somehow, that works well. Good review. Thanks – I will check this out because like you, I liked him on that show oh so long ago and always hope he’ll go well.